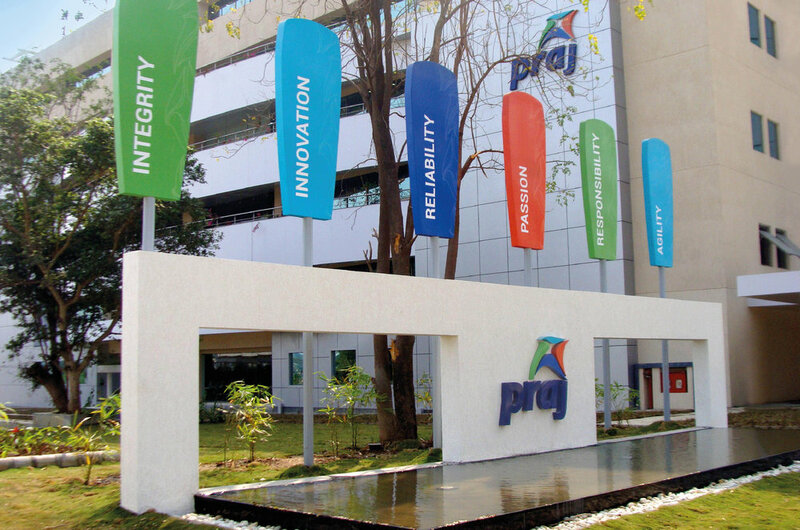 A few years ago, Praj Industries, a fast growing company, transitioned to a larger office premises. Elephant was approached to re-design their brand identity and provide brand experience and signage solutions for the new facility. We plotted the visitor & employee journeys right from the main entrance, flowing through workspaces, common & recreational areas and identified relevant experience touch-points for each entity. For example, at the entrance driveway, visitors are greeted by a bold Praj logo reflecting in a tranquil water-body against the vibrant backdrop of the six Praj Value flags. Entering the elevated atrium lobby, a ‘Magic Logo’ ceiling installation designed to delight & surprise visitors, appears as a series of random yet aesthetic shapes, except when viewed from a specific standpoint, where the shapes materialize into the Logo, as if by magic. From here, guests are escorted to an Experience Centre that puts forth the company’s processes, initiatives, global presence and achievements in an engaging, visually appealing manner. At the cafeteria, specially crafted wall-mounted ceramic plates with quotes & portraits of famous personalities add a layer of inspiration and introspection. 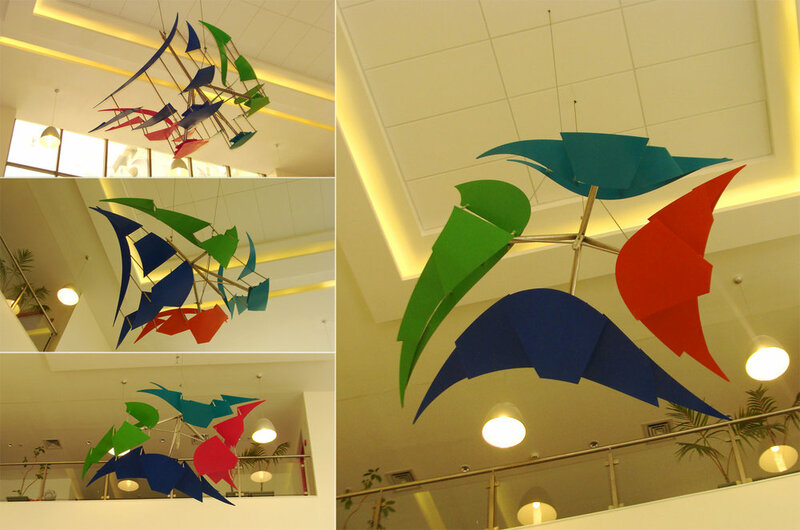 Employees were enthused to share their ‘Big dream for Praj’ and these were captured as a wall composition of clouds outlined in brand colours. The visual theme of each floor revolves around a specific Praj value with corresponding colours adapted to create a cohesive language through surface graphics, fabric textures, content and murals. Aligned with the essence of Praj, meeting rooms are named after illustrious Indian scientists. A contemporized, symbollic sculpture of ‘Chanakya’, Indian teacher, philosopher and economist, depicts his enlightened state, writing his famous scriptures while immersed in a surreal, (hand-drawn) forested landscape. 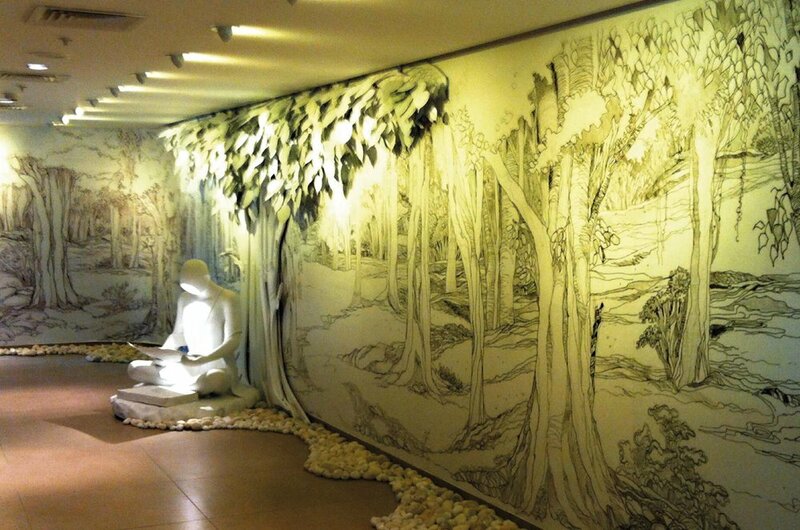 This unique mixed-medium installation unravels its narrative at the entrance of the Chairman’s floor. It was made using sustainable materials and manifests the company’s image and principles as a self-sufficient, eco-friendly and sustainable company. 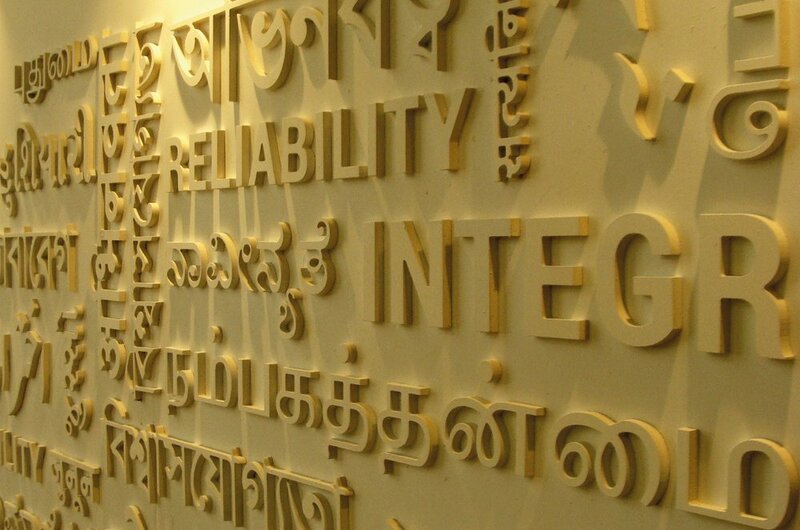 Our aim was to instill a feeling of ‘Praj Pride’ in the employees and showcase it to the visitors. Since commencement in 2014, Praj has reported higher employee satisfaction and visitor interest in their new corporate office.